Otherjones.com: A New Kind of Convergence? No one who has ever read fairy tales or cartoons can be surprised at the latest developments in the Trump Presidential Saga: the President’s son-in-law, Jared Kushner, has been trying to do diplomacy differently, while the press accuses him of mixing his family’s business with America’s most powerful adversary: China. But what if this was simply the current version of the political notion of convergence, which optimistic foreign policy analysts believed would ultimately prevail with respect to America’s relations with the Soviet Union? According to this theory, gradually, the US would become more socialist, as the Soviet Union became more capitalist. When the Soviet Union imploded, in 1991, there had been few signs of convergence. Following that cataclysmic event, Russia, as the largest country in the world was once again called, was introduced to capitalism via shock therapy that nearly brought the country to its knees. Meanwhile, under Bill Clinton, the United States became charier with its social benefits. So much for theory. But eighteen years after the appearance of Vladimir Putin as the head of Russia, with Donald Trump as US president, an as yet unimagined form of convergence may be taking place. America's hundred year love affair with gangsters is reaching a peak, leaving the ‘robber Barons’ in the dust with a new form of personal presidential involvement in the economy. 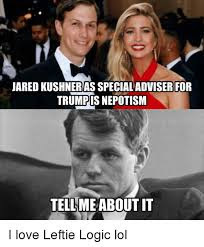 Seen from a different angle, however, after a century of rabid anti-communism, the President’s son-in-law appears to be taking a page from the Chinese form of government involvement in the economy. Ever since the death of Mao Tse Tung the father of the Chinese Revolution, in 1976, China has been inching toward a new type of socialism, in which the state increasingly acts like a private company, seeking profit wherever it can find it, allowing private investors to do likewise as along as their initiatives are considered of benefit to the state. America, on the other hand, has come a long way from gun-toting gangsters riding on Model T running boards, in a unique trajectory: Jared Kushner’s appearance on the front pages is due more to his upending of traditional diplomatic and intelligence practices, than to his position as favorite son-in-law. Position which, in turn, highlights just how much control the FBI and the CIA exert over America’s relations with the rest of the world. An obsession with secrecy, evidenced in practices such as requiring that government — and even more so presidential personnel — never meet with a foreigner without a ‘note-taker’ present. .. The media enjoys spotlighting these occasions, as when Trump left his place at a dinner table to talk to Vladimir Putin without an interpreter, an unheard of occurence that was presented as breaking news for days. While citizens should not tolerate a President’s family mixing its private business with that of the country they are elected to serve, it’s clear from a recent report in the New Yorker that Kushner, a dashing young man who has run a sophisticated, high stakes business, trusts his gut more than Cold War memes. (https://www.newyorker.com/magazine/2018/01/29/jared-kushner-is-chinas-trump-car mbid=nl_Magazine%20012218&CNDID=50461342&spMailingID=12793786&spUserID=MjA3NzYwNDgyMjE3S0&spJobID=1322010492&spReportId=MTMyMjAxMDQ5MgS2). The fact that he has still not received an official ‘clearance’ giving him access to classified documents, shows just how hide-bound the US system has become.) If Americans were better informed, they would realize that personal relationships among the leaders of the world’s most important countries had been the norm until they were subordinated to America’s obsession with secrecy, and that in the present state of affairs, they foreshadow the multi-polar world that Xi, Putin, Modi et al are promoting — without the US. By electing Trump, Americans put into question the democratic guarantee implicit in the principle of one man one vote. However, allowing the family business/government approach to world affairs to continue, they could conceivably free the country from its hateful and onerous role of world cop.